Unlike loans, scholarships and grants do not have to be repaid. Competition for scholarships is high, so it is important to start as early as possible when identifying funding sources. There are three main sources to consider – Krannert, Purdue, and external sources. The Krannert School of Management offers a number of scholarships to students each year. 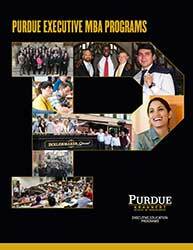 To be considered for a scholarship to a Purdue Executive MBA program, complete the scholarship essay, found in our online application. Scholarship decisions will be made after an applicant is admitted by the Purdue Graduate School, and are made based on a complete review of the applicant as well as the interview. As scholarships are provided on a rolling basis, it is to your advantage to apply as early as possible, while funds are still available. Scholarship amounts include any and all offers or discounts from our Executive Education Programs and are capped at 15% of tuition. Scholarships are awarded in Purdue EMBA Programs for tuition payments 2-5, with no distribution awarded toward the first tuition payment. timeliness in submitting scholarship application. Questions regarding scholarships should be directed to the executive director of Krannert Executive Education Programs, Aldas Kriauciunas, at akriauci@purdue.edu. Through the University you may apply for several general scholarships for graduate students that are awarded by the University and related sources. A database of funding opportunities and other helpful information can be found on the Graduate School website.